The Cabin in the Woods is some distance away from your traditional horror film, but what makes it so different? Set in the middle of a secluded forest, a group of friends find themselves caught up in the middle of a deadly secret. Attacked by a group of hillbilly zombies, they must find a way to uncover the truth while saving themselves. Starting alike to Evil Dead, five friends head for a quiet break in the woods where they explore a cellar and are attacked by a group of zombies. Due to these extreme similarities to Raimi’s original, the slow start dampens interest on what has become a stereotypical horror film setup. However it’s not long until interest is reignited with some mysterious scientists in a lab betting on what creature will attack the group. Introducing this additional big brother side-plot adds a new dimension to normal horror films and offers a gateway for the fantasy genre which introduces a mass of deadly mythical and legendary creatures. The most interesting aspects of the film are the other creatures that don’t have the chance to directly attack the group; these include an evil mermaid, a small ballerina with only teeth for a face and a mechanical scorpion. Once let free by the protagonists, the film capitalises on the shock value by literally filling a room with an inch of blood and guts. The only complaint is that these interesting creatures are only in the film for a few scenes, with minimal screen time. Introducing them earlier would have increased the appealing fantasy aspect but perhaps lessened excitement towards the end. Where this differs from many other horror films is mainly down to its complexion and mysterious story. 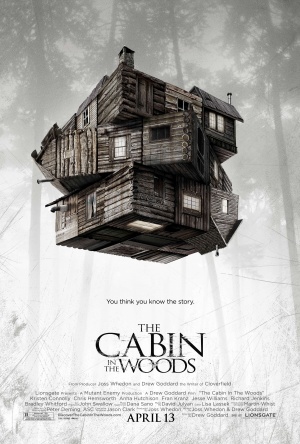 Despite the misleading title, poster and aura of the film, The Cabin in the Woods has many more layers than the average horror flick. Combining fantasy, gore and the brilliant mythical creatures this film would be a must for Pan’s Labyrinth fans.